With electricity costs on the rise, LED lighting has become the norm for all newly built courts, but at CourtCare we have developed the perfect retro-fit solution for your existing fluorescent twin batten fittings. 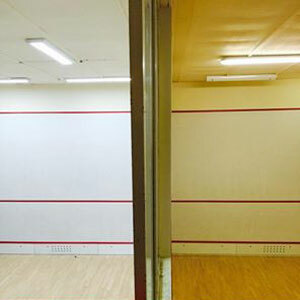 The only LED squash fitting available on the market that is 1800mm long, it has been specifically designed as a direct replacement in terms of size and location, which keeps wiring and decoration costs to a minimum. Whether it’s 6 units for a solid back, or 8 fittings for a glass backed court, our super slimline fittings provide the perfect lux levels. They are tube free and consist of an opaque flat panel of even and consistent light. They can be surface mounted or hung on chains, and provide a saving of over 50% on running costs and an on-site guarantee of 5 years. We offer supply only, or supply and installation.